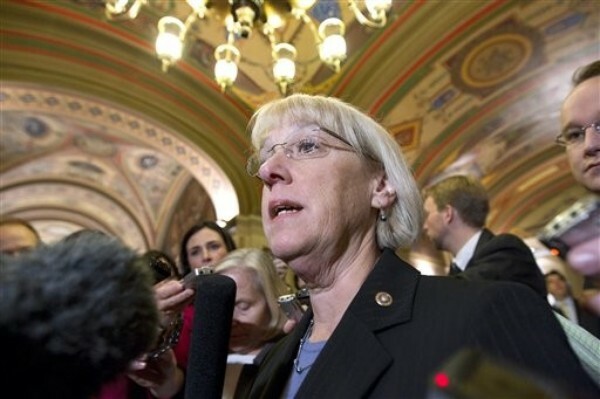 With three congresswomen running for Senate seats at her side, Democratic Senatorial Campaign Committee chair Patty Murray suggested 2012 will be the new year of the woman. "I know that we need diversity in the Senate, and we need people who come to the job who really want to make a difference for the county, and when I look across the country, I see women who understand that," Murray said during a briefing with reporters Tuesday at Sewall-Belmont House and Museum, the headquarters for the National Women's Party in Washington, D.C.
Murray, a senator from Washington state who was first elected in 1992 -- which was itself dubbed the "year of the woman" -- has the arduous job of trying to maintain the Democratic majority in the upper chamber. Republicans only need a net of four seats to gain control of the Senate, and in an election when Democrats have to defend 23 seats while Republicans only have to defend 10, the forecast isn't exactly sunny for her party. Murray suggested that this type of climate requires Democratic candidates to sell their personal narratives, which were a substantial component in the recruitment process, and use them to convince voters they know, understand and share the burdens of constituents struggling with the down economy. This approach is in line with the DSCC strategy to localize Senate races in a general election year. Murray said the 11 women running for the Senate -- six incumbents and five new candidates -- have "the potential of really changing the dynamic of the U.S. Senate: how we work and how we respond to this country's needs at a critical time." She suggested that narrative has the potential to attract voters in an election year where congressional approval is at an all-time low. She pointed to the women sitting beside her -- Reps. Shelley Berkley of Nevada, Mazie Hirono of Hawaii, and Tammy Baldwin of Wisconsin -- as examples of people who have emerged from past personal hardships and can relate to voters. In conjunction with recruiting candidates with compelling personal biographies -- Murray also touted Arizona Democratic candidate and former Surgeon General Richard Carmona -- the DSCC has been remarkably decisive in some Democratic primaries. Murray is supporting Hirono, for example, who faces a primary challenge from former Rep. Ed Case. Gender is not a factor, she said, "it just so happens we've got some really brave women in this country." The DSCC hasn't yet endorsed Martin Heinrich, a congressman recruited from New Mexico, but Murray says she looks forward to supporting him. State Auditor Hector Balderas is also running for the Democratic nod. Murray said she expects Rep. Chris Murphy to win retiring independent Sen. Joe Lieberman's seat in Connecticut, though former Secretary of State Susan Bysiewicz is also running as a Democrat. This approach is meant to thwart bruising primaries, which Murray predicts the GOP will have to contend with. "The reason [Republicans] have primaries is because they have Tea Party candidates challenging their Republican mainstream candidates, and that's a real issue for them," she said. She pointed to crowded Republican races in Florida, Missouri, Nebraska, Michigan and Wisconsin as examples and said these types of primaries caused the GOP to lose otherwise winnable races in 2010. Murray also highlighted her party's good chances of holding on to seats in California and West Virginia, where Republicans have yet to put forth viable candidates. But she demurred when asked whether Nebraska Sen. Ben Nelson is definitely running again. Nelson has said he will make a decision after the Christmas holidays but last week released internal polling that put him ahead of his Republican challengers. Murray called Nelson, considered among the most vulnerable Democrats in this election cycle, a "fighter" and said she hopes he will run. When asked whether Democrats can win Nebraska without him, Murray said it was too early to say. "If you would have asked me that question about North Dakota a year ago, I would have had a much different answer than I have today," she said, pointing to former North Dakota Attorney General Heidi Heitkamp's entrance into the race last month to fill retiring Democrat Kent Conrad's seat. I don't think we can predict what happens [this far out]." Caitlin Huey-Burns is a congressional reporter for RealClearPolitics. She can be reached at chueyburns@realclearpolitics.com. Follow her on Twitter @CHueyBurnsRCP.